This dress has a princess seam composure and is made of a shiny gold polyester and a black cotton. The gold polyester has a Rorschach Ink Blot pattern on it made with a Thiox discharge paste. The whole dress is symmetrical. The body of this dress is made of a shiny gold polyester and the sleeves and details on the bottom are made of black and white cotton. The pattern on the cotton pieces was created through Arashi Shibori and several steps of dying with MX dyes, removing color with a Thiox discharge, and dyeing again. The gold tee is made of a gold shiny polyester and has an oversized boxy shape. This skirt is made of a black cotton with Rorschach Ink Blot patterns printed on the front and back panel with a Thiox discharge paste. Front View. This T-Shirt is made of a black cotton with a Rorschach Ink Blot pattern resembling a skeletal figure printed with a Thiox discharge paste and black faux fur sleeves. These pants are made of a black cotton with Rorschach Ink Blot patterns printed onto the front with a Thiox discharge paste and rib knit at the waste and ankles to fit against the form. Back View. This T-Shirt is made of a black cotton with a Rorschach Ink Blot pattern resembling a skeletal figure printed with a Thiox discharge paste and black faux fur sleeves. These pants are made of a black cotton with Rorschach Ink Blot patterns printed onto the front with a Thiox discharge paste and rib knit at the waste and ankles to fit against the form. The body of this dress is made of jersey cotton dyed a light pink and the sleeves are a black cotton. 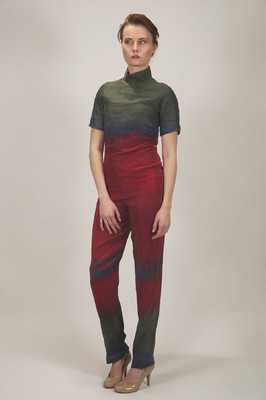 A Rorschach Ink Blot pattern is printed on the dress made with a Thiox discharge paste. The shoulders of the dress are a transparent gold glittery polyester. The leggings are made of a black rib knit and each legging has a different Rorschach Ink Blot pattern printed onto it with a Thiox discharge paste. The majority of the dress is made of a black cotton, while the patterned pieces are a black rib knit with a Rorschach Ink Blot pattern printed on them with a Thiox discharge paste. The patterns are meant to resemble the skeletal figure in the place that they lay on the body. This dress is made of a shiny gold polyester and moves like liquid fabric. This faux fur vest is super chic with a large collar and has a gold polyester lining. These armbands are made of a black rib knit and have Rorschach Ink Blot patterns printed onto them with a Thiox discharge paste. The bottom layer of this look is a black cotton dress. The top layer is made of gold and black glittery polyester that is semi-see-through. 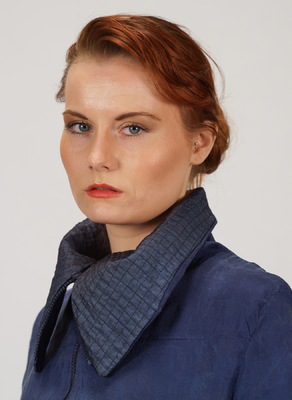 The collar is has pointed ends and is light and bouncy. This dress is made of a soft jersey cotton dyed purple with MX dyes. The pattern is created with a Thiox discharge paste that was splattered onto the fabric. The pattern on the sleeves was created by a technique called Arashi Shibori. Hand painted silk dupioni dress with stand up collar and kimono sleeves. 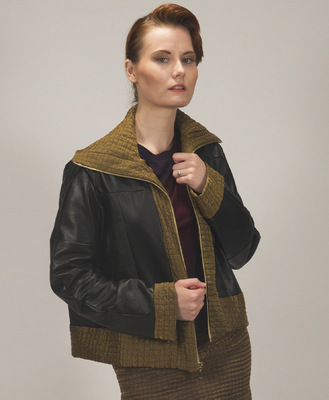 This leather bomber jacket is put together in a patchwork style and has a boxy shape. The edges and collar are quilted with gold glittery polyester and harem cloth to create a puckered and highly textured checker pattern and add a little glitz and glam. This elegant and comfortable maxi dress is made of jersey cotton and hand painted with many strokes of vibrant colors on the top and asymmetrically fades into a midnight blue around the chest. The slit up one side adds a dose of sexiness as does the fitted shape. 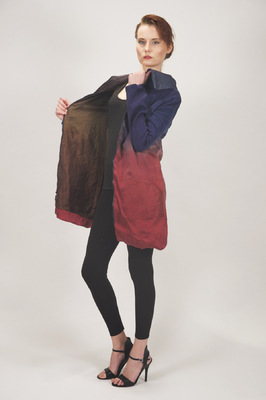 SIlk Dupioni Jacket that was dip-dyed from each end with a different color to create a variation of shades. The lining is a gold shimmery polyester that was also dyed different shades and the collar is hand quilted to create texture. A close-up detail shot of this quilted collar. Harem cloth was stitched to the polyester lining in a checkered pattern and shrunk to create puckering between the stitches and texture. This dress is made up of patches of three different fabrics (charmeuse, silk dupioni, chiffon) all hand dyed with different techniques. 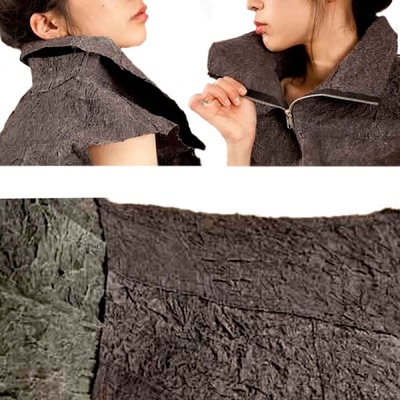 The shoulders are felted with assorted toule and metallic fabric to create high texture. 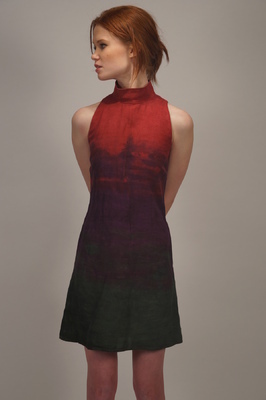 This stand out maxi dress is made of a medium weight chiffon that was hand dyed in multiple steps with the technique of Arashi shibori to create the bold patterning. There is a short slip underneath ending above the knees and a zipper up the back. Front view of a two piece outfit made from handmade paper. The fiber Abaca was beaten, pressed flat, crumpled while still wet, flattened again when dried, and painted with egg whites to create this unique texture. The pattern of the apparel was created from scratch and sewn together in pieces. Up close detail views of a two piece outfit made from handmade paper. The fiber Abaca was beaten, pressed flat, crumpled while still wet, flattened again when dried, and painted with egg whites to create this unique texture. The pattern of the apparel was created from scratch and sewn together in pieces. Silk Charmeuse slip dress dyed by the techniques of Arashi Shibori. This two-piece matching top and pant duo is made of Silk Dupioni that was hand painted to create the vibrant patterning and color changes. The top is very fitted up top with a collar and flares out at the bottom with a zipper up the back. The pants have a seamless side zipper and belt loops. Hand painted linen sleeveless dress with collar and zipper up the back. This T-Shirt Dress is made of jersey cotton and was hand painted in separate pieces to create the patterning. Gold quilted details were added at the cuffs, shoulders and center front to add flair. This T-Shirt dress is made of a soft jersey cotton that was hand dyed in separate pieces. The patterning on the body of the dress was created through Itajime Shibori and Thiox discharge to create a symmetrical pattern that resembles the stream flows of a river. The gold polyester cuffs are quilted with a checkered pattern to create texture. This T-Shirt is made of a soft and comfortable jersey cotton with a cutout criss-cross back. It was hand painted alternating between two colors in a diagonal pattern. The mini skirt is quilted with a top layer of gold polyester then purple jersey cotton then a layer of harem cloth and stitched in a checkered pattern to create puckering and texture. Hand painted jersey knit with MX dyes with thiox screen printed over top. The print was digitally designed and put into a repeat to represent constellations. The background is painted like a galaxy. The pattern of the dress was made from scratch to create a tight fit with wing like sleeves.